Eastlake Woods has the largest homes in all of the Eastlake Communities. There are no Condo Communities in Eastlake Woods. 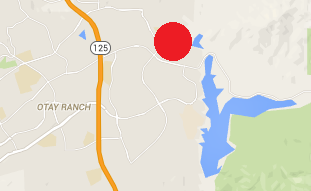 It’s also one of the few areas in East Chula Vista where lots were sold to build custom homes. This area is called The Gates at The Woods where there are mansions on large lots many of them over an acre. All of the streets in the Gates have huge iron gates that secure these wonderful estates. Lots are still available in the Gates and are for sale from time to time if you want to build your own custom home. The Gates has many properties that overlook the Upper Otay Lake. We were the Featured Realtors of the Tour De Elegance when the Gates was open many years ago. We even hosted the Johnson Beucler Home and sold it for the builder. The home won “Best of Show” hands down. Eastlake Woods only has 4 neighborhoods in it. It has a very nice park which is called Montvale Park and it is technically in Rolling Hills Ranch. There are 2 public schools in Eastlake Woods which are Eastlake Middle School and Salt Creek Elementary School. Eastlake Woods has an amazing pool area that is the finest in all of the Eastlake Communities. At least in my opinion it is. There is also a firehouse across from the pool. The architectural design on the firehouse is like no other firehouse you’ve ever seen, truly beautiful. There are many trails in the Woods and one of the trails will take you on the east side of The Gates with mountain and lake views all around you. There’s lots of wildlife as well. 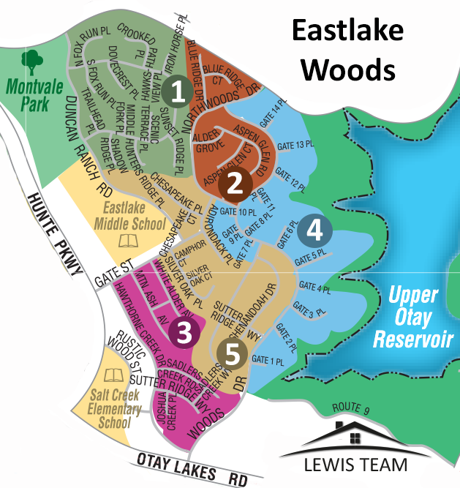 Eastlake Woods is west of the Upper Otay Reservoir, north of Eastlake Trails, west of Eastlake Trails North and south of Rolling Hills Ranch. It is in the Chula Vista ZIP code of 91914. It has mello-roos and an HOA. Interested in Eastlake Woods Real Estate?